0 Comment August 16, 2017 Like? 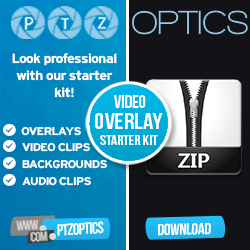 In this live stream, Paul shows off the latest NDI pan, tilt, zoom cameras from PTZOptics. We start with a look at the new NewTek NDI Studio Monitor. This software allows you to monitor and control PTZ cameras on your Local Area Network. NDI (Network Device Interface) has now become a standard for pan, tilt and zoom control. The Studio Monitor has intuitive setup which includes auto-detection for all NDI sources on your network. The monitor will automatically know whether the camera is PTZ enabled and it will show a PTZ control system on the screen. We also, show the settings allowing for low bandwidth IP streaming, broadcast configurations and audio monitoring. Next we demonstrate the NewTek Virtual Input which is a software for Windows that is included with the PTZOptics NDI cameras. This software will allow us to create a virtual webcam input and select the inputs to source from. Therefore a software such as GoToMeeting, WebEX or Zoom can easily bring in IP video cameras and quickly switch between the cameras. You can see that Wirecast will automatically recognize NDI sources on your network. Currently we have shown the ingestion of NDI video sources inside Wirecast. We discuss the differences between Wirecast and the other live streaming software that we review in this live stream. We are able to add NDI inputs using the simple “Add New Shot” button inside Wirecast. Once the NDI cameras and video inputs are inside Wirecast we can quickly switch and transition between sources. We use vMix in our live production and shared the look at each NDI camera available in vMix. We also show how to use VISCA over IP to control the PTZ cameras inside vMix. We can create camera presets as inputs inside vMix to allow our NDI cameras to be remotely controlled. We also show off later in the live stream that vMix supports both in and out NDI streaming over the Local Area Network. During the live stream we also demonstrate the hot-swapping NDI camera switching support inside vMix. It’s very nice to see NDI supported by OBS (Open Broadcaster Software). We were able to download the OSB plugin here. The author “Palakis” mentions the following prerequisites “You’ll need CMake, the NewTek NDI SDK V2 and a working development environment for OBS Studio installed on your computer.” The features are included for both NDI ingestion of video in OBS and video output! xSplit is an extremely popular live streaming software used by over 8 million users. xSplit was actually an early adopter of the NewTek NDI as an output but to the best of my abilities I could not find native support for NDI camera ingestion. Therefore you can still use the NewTek NDI Virtual Input mentioned above. The issue with this approach is that you can only control a single NDI camera at a time! Here you can see Livestream Studio being used to ingest multiple NDI sources. This was incredibly easy to use. We are currently working directly with Livestream to build in PTZ controls into Livestream. Mike Latta What POE do the switches need, POE or POE+ ?? John Trapani I have 2 separate GbE ports on my computer’s motherboard, can the NDI camera plug into one of these ports? Mike Latta Matthew D could you not use a crossover ethernet cable between the camera and the 2 NIC of John’s computer? guitarguts666 Andrew has already stated that max would be between 6 to 8 signal on a gigabit network via NDI. Tim Murawski Is the NDI version available as a firmware upgrade? I have two of the 20X-G2 cameras that I just installed. RCTVHD If there’s any network interruption by power, will the NDI camera return automatically? John Trapani Perfect, thank you. CraftyCidDJ How are you all doing? CraftyCidDJ What do you think about TallyTec’s pro system? John Trapani Do you recommend the live audio be connected into the camera or direct into the computer? Rick Clear Building out a new multi studio community media station in Atlanta…all IP first. CraftyCidDJ What do you think about TallyTec’s pro system Paul? Joey Baron Is tallytec ip? John Trapani Paul/Matt – great job with the show! geminiaudiovideo Great job. Your a brave soul to do this live. Big Respect! 148291485214845 This has been a very helpful show. Paul Richard and John Reese at PTZOPTICS have been very helpful with the 20x Gen2 PTZOPTICS camera I purchased. Tony Indilicato Is this broadcast via IP?